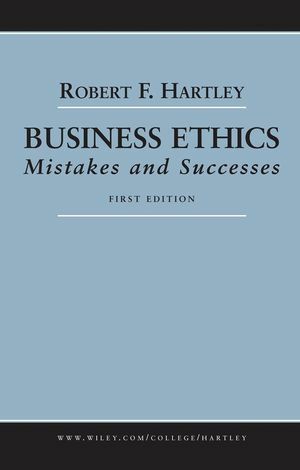 Business Ethical Mistakes and Successes is a new book in the popular and successful series from Robert Hartley. Like Marketing Mistakes and Management Mistakes, this new text provides short, lively cases to help students learn from the failures of the past and learn to be better corporate citizens through discussion and analysis of these lessons. The cases bring to life the major players in each of these ethical dilemmas to help students understand what problems, temptations, and decisions these executives faced. Hartley uses a combination of historical and recent cases to set the stage and give context to our current environment of sensationalized stories of poor judgment and greed played out in the news. Through this examination of the failures of the past, Hartley helps students get absorbed in the situation and learn from the experiences of others. Bob Hartley is Professor Emeritus at Cleveland State university's College of Business. There he taught a variety of undergraduate and graduate courses in management, marketing, and ethics. Prior to that he was at the University of Minnesota and George Washington University. His MBA and Ph.D. are from the University of Minnesota, with a BBA from Drake University. Before coming into academia, he spent thir5teen years in retailing with the predecessor of Kmart (S.S. Kresge), J.C. Penney, and Dayton-Hudson and Target. Positions held included store management, central buying and merchandise management. His first textbook, Marketing; Management and Social Change, was published in 1972. It was ahead of its time in introducing social and environmental issues to the study of marketing. Other books, Retailing, Sales Management, and Marketing Research, Followed. In 1976, the first Marketing Mistakes Supplemental book was published, and brought a new approach to case studies: student-friendly books, and ones more relevant to career enhancement that existing books, In 1983, Management Mistakes was published. These books are now in the 9th and 8th editions respectively, and have been widely translated. In 1992, Professor Hartley wrote Business Ethics: Violations of the Public Trust, which was the predecessor to this Business Ethics Mistakes and Successes. He is listed in Who's Who in America, and Who's Who in the World. Chapter 1. Introduction and Perspective. PART I: CONTEMPORARY VIOLATIONS OF THE PUBLIC TRUST. Chapter 2. MetLife: Deceptive Sales Tactics. Chapter 3. Ford Explorers with Firestone Tires-A Killer Scenario. Chapter 4. ADM: Price Fixing, Political Cronyism, and a Whistleblower. Chapter 5. Al Dunlap Savages Sunbeam and Scott Paper. Chapter 6. United Way: A CEO Batters a Giant Nonprofit. Chapter 7. Tobacco: Long Callousness to Public Health. Chapter 8. The Savings and Loan Disaster: Managements Repudiating Their Responsibility. Chapter 9. WorldCom/MCI: Massive Accounting Fraud. PART II: CLASSIC ETHICAL VIOLATIONS. Chapter 10. General Motors' Corvair vs. Ralph Nader: Triggering the Age of Consumerism. Chapter 11. Union Carbide: Assaulting the Ohio Valley. Chapter 12. Union Carbide's Bhopal Catastrophe. Chapter 13. Nestle's Infant Formula: Pushing An Unsafe Product in Third World Countries. Chapter 14. The Dalkon Shield: Ignoring User Safety. Chapter 15. Exxon's Alaskan Oil Spill-Environmental Destruction on a Giant Scale. Chapter 16. ITT: Heavy-Handed Interference in a Foreign Government. Chapter 17. Lockheed: Overseas Bribery Gone Rampant. Chapter 18. General Dynamics: Fleecing U.S. Taxpayers. PART III: QUESTIONABLE ETHICAL CONDUCT. Chapter 19. Wal-Mart:A Big Bully? Chapter 20. Nike-Using Cheap Overseas Labor Ethical? Chapter 21. DaimlerChrsyler: Flagrant Misrepresentation of a Merger. PART IV: PARAGONS OF GOOD ETHICS PRACTICES. Chapter 22. Johnson and Johnson's Tylenol Scare-The Classic Example of Responsible Crisis Management. Chapter 23. Herman Miller: Role Model in Employee and Environmental Relations. Chapter 24. Conclusions: Lessons from the Past.